I sit with a group of people every Wednesday night that help keep me focused on both the enemy and the Great Love. Enough said. If you want to know more, my email is around here somewhere. 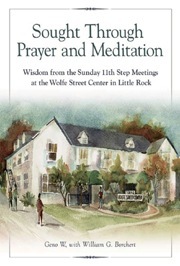 We’ve been reading together from a book, Sought Through Prayer and Meditation, published by Hazelden. Last night, as we read, a phrase jumped from the page and began running around in my imagination. The phrase is running around there turning on lights, discovering new metaphors, writing poetry, and turning over dumpsters full of old, rancid, even carcinogenic dogma. You may have to bear with me for awhile here, read the white spaces between words and lines, or maybe even allow my words and phrases loose in your imagination, to do there what they will. I promise I will only describe my reactions and thoughts in terms personal to me, without telling you how you must or should or are commanded to react or think for yourself about that phrase. Because the life of God is different in me than it will ever be in you. The life of God is not a sometimes sharp-edged definition formulated by others and passed on over the centuries through dogmatic teachings, for which I am a modern agent who must somehow coerce you today into accepting this phrase in its ancient form and colors. In fact, I doubt that the life of God has colors which could be defined anyway; they’re probably off the rainbow somewhere in infrared or ultraviolet or gamma light where birds and insects and fish are swimming and flying through colors you and I have never seen (and will never see!). I’m almost certain that the life of God could never be honed or trimmed for the convenience of my linguistic limitations, from the light-year-spanning breadth and quark-deep-depth that the life of God must , among many other dimensions, occupy. I know for a fact and I am proving to you at this moment that the life of God is a force and a fact that cannot be written about, bought from any purveyor of abstract notions, or referenced in Google, history, the Bhagavad-gita, Quoran, or Bible. The life of God is slippery, and not. It is big, and not. It full, empty, dark, light, complete and whole, partial and growing, Mysterious, and –if not Knowable- perceptible. And that is the word I’ve needed here: perceptible. The life of God is perceptible. But impossible to explain. And now I’m laughing so I’ve just confirmed that the life of God is funny, too. To the Me with no name. To the Creation without boundaries. And to You, whether you know it or not.